On Thursday I woke up a bit confused. Sometimes I go so fast that all of a sudden I find myself a bit lost. What is my purpose today I wondered? I spent a bit of time wandering around half doing chores and then I had an idea. 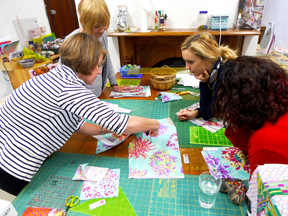 One of our new classes this year is Working Wool with Wendy Williams. I don't know about you but I have looked longingly at wool projects for a long time. Wagga's I can handle. Their wonky structure and big bits fit into my schedule and relaxed style. However, the allure of embellishing pieced or appliqued wool always seemed just a bit foreign to me. Every time I have tried to do a wool project it has been abandoned. I just sort of get lost wondering where I am going so in an attempt to wipe away the confusion So, as I walked out the door to go to"work" I grabbed my basket of goodies and headed toward the light. Wendy, always prepared with tips and examples, ideas and directions had set the scene for using wool with lots of variety built into the plan. My fingers started to twitch. It isn't easy to hide in the shop and to take in all the wonders on offer in the creative spaces. However, I did it...set aside the computer and phone and sat in the corner with my picnic basket of wool goodies. Sigh. As is so often the case, when I do stop I to make it just pours out with little regard for the ideas on the to do list. The best thing about wool is that with a pair of scissors and only a smidgeon of an idea something starts to appear. We made some bias strips with a new fabric Echo by Lotta Jansdotter. These fabrics have nice organic lines and introduce some beautiful fresh colour to the wool. Mixing the textures of cotton fabric, wool and linen creates a nice composition. Touch becomes as important as sight. There was plenty of time to consider and review and in the group setting it was easy to push through the barriers with a bit of help. Everyone had special treasures in their own baskets so it was fun to see other people's collections of materials and ideas getting an airing. Before long things were getting stitched together. I couldn't believe how quickly the shapes were coming together and I admit, it got a bit exciting. When I got home I got stuck right into it again and this time I think the project will actually get finished. I want to make this into a cushion for our lounge but that could change into something bigger or even more cushions for the lounge! One of the reasons to push through the aforementioned wool block is because we are hosting Sue Spargo next August in Sydney. Sue has made working with wool attractive with her contemporary folk art style. the dates are now finalised and a plan is forming. The workshops will be held Friday, Saturday, Sunday the 10, 11 and 12 of August. If you are interested you can sign up for one, two or three days. We are now taking deposits so if you want to come and would like a place contact us now! Out of town? 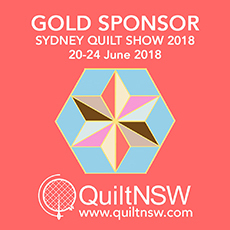 It might be a good weekend to come to Sydney because the Hunters Hill Quilt show is on the same weekend so it would be a double whammy of good quilting fun! 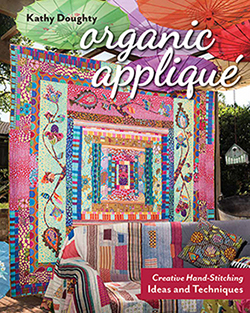 So you might have a project on the go from one of Sue's books, patterns or BOM's or you might want to start your own dream project using your basket of delights. Over the next few months we will be adding to our collection of wooly things and embellishing items. There are some beautiful textures in wool and flannel as well as new fabrics arriving all the time. good to see you've caught the applique bug too Kathy! Would love to know how to get the pattern for that owl quilt! Whose is it? Hi Kathy! Sorry I didn't get to stop by the shop again to say good bye. We just ran out of time in the wrap up to move back to the USA. We are in Moraga, CA outside of SF in the East Bay. Slowly finding our feet back home. 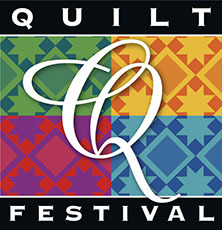 I am still watching the blog and your tree quilt looks AMAZING! Have not hit the local sewing stores yet.....still in the overwhelmed stage at this point. Just wanted to say hello and will keep in touch. Thanks for the entertaining read! Happy New Year and keep up the good work in 2012!